Here you have it. The first Lionel Messi exclusive colour way has landed on the adidas NEMEZIZ. Black, white and all kinds of right, it’s a paint job straight out of the top drawer as Messi looks ahead to his first season in the new boot. 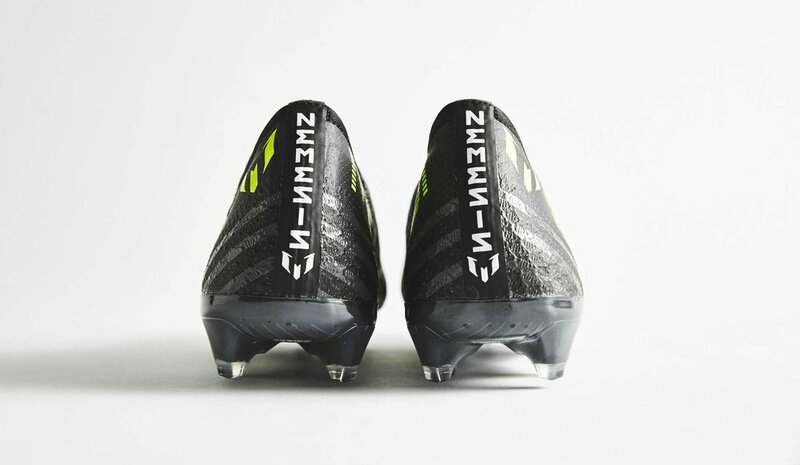 With the adidas MESSI 15.1 and MESSI Pure agility in the rear view mirror, adidas have ditched the idea of a signature Messi silo with the arrival of NEMEZIZ. Of course, special treatment is still reserved for Barcelona’s #10 and moving forward expect to see a raft of Messi exclusive designs across the NEMEZIZ canvas, starting right here. It’s a colourway we would have expected to land on the standard NEMEZIZ without the ‘MESSI’ label. Featuring a black upper with grey shades across the trademark striping of the boot, the adidas three stripes stand out in contrasting white while the MESSI branding pops in a “Solar Yellow”. The AGILITYBANDAGE that wraps the boot acts as the canvas for Messi’s logos, while the heel tape features both the NEMEZIZ and Messi logo. If you’re still new to the adidas NEMEZIZ, listen up. First up we've got a unique AGILITYBANDAGE that features TORSIONTAPES technology to keep the foot locked down and deliver ultimate fit, whilst a dual-lock collar secures the ankle in place to enable that explosive change of direction. Next up there's the TORSIONFRAME outsole that features an ultra-lightweight construction and TORSIONRIBS to provide dynamic push off support; a key feature for agile movement. The new AGILITYKNIT 2.0 interlocking yarn structure provides a soft direct touch and a lightweight adaptable feel.